In the middle of November 1943, the 2nd Battalion went out of the line while the two other brigades of the 78th Division swept on to the Sangro, along the north bank of which the enemy had built powerful defences. It was a good defence-line, with the ground forming several natural intermediate outposts. There was the river itself, fast flowing from the incessant rain and the melting snow on the hills. It was deep, with an average width of one hundred feet. The exact distance could not be accurately determined because the flow and height of the torrent varied overnight. During the day the river might be fordable, but after rain had fallen, it would rage along, flooding its banks, and become not a hundred feet, but a hundred yards wide. SMASHING THE GERMAN WINTER LINE. Uncertainty was an additional handicap and, with the river, formed a weighty obstacle to an early advance. There was also a wooded escarpment about a thousand yards from the river and fifty feet high. This, curiously enough, offered an advantage to the attacker, because it gave complete cover from the main ridge above on which the main defences were built. Most of the surrounding country was plough-land, thickly wooded in parts and with small, knobby hills. Towards the summit of the ridge there were wide terraces. Altogether it was bad country for tanks, and three towns, Mozzagrogna, San Maria, and Fossacesia, formed main bastions in the defences on the summit of the ridge. On the other side it gradually sloped down to the east coast and the Adriatic. The first task was to destroy the perimeter defences along the escarpment and this was accomplished by the two other brigades. Then came the main attack on the Winter Line, and the Irish Brigade was ordered to smash the right half along Fossacesia Ridge, supported by the 4th Armoured Brigade, while the 8th Indian Division was to smash the left half. Plans were prepared in great detail, and orders were discussed on a cloth model with the majority of the German defences pinpointed. In the meantime Mitchell bombers gave the ridge a thorough pounding. On the night of November 20, the battalion moved forward from Casalbordino, carried on the tanks of the 44th Royal Tank Regiment. As dawn came, rain started to fall and the tracks and fords leading down to the Sangro became impassable. The battalion was due to cross the river the following night, but the attempt had to be postponed as the tanks could not go on. The morning dragged as further orders were awaited, and then they were told to concentrate near the village of Paglieta. This proved to be a very gruelling cross-country march up hill and down dale, across rain-sodden plough-land and along narrow uneven tracks. Plans were again changed and three days later the London Irish were back at Casalbordino waiting for the weather to clear. Conditions improved in a few days and when the London Irish once more reached the Sangro they crossed and found the tanks waiting for them. That night the attack on Mozzagrogna and San Maria, the left bastions of the Winter Line, was made by the 8th Indian Division. It did not altogether succeed, and to meet a confused situation plans were hurriedly readjusted. The Irish Brigade and the 4th Armoured Brigade were ordered to tackle San Maria and Li Colli, a hill to the right of the town, and then sweep through the defences of the ridge to Fossacesia. At dawn on the 29th the 6th Royal Inniskillings and the City of London Yeomanry advanced on San Maria and Li Colli. The opposition was formidable and tank progress was slow. It was nearly dark before they had successfully completed their tasks. Meanwhile, the London Irish and the 44th Royal Tank Regiment had left the comforting shelter of the escarpment and moved forward a mile. 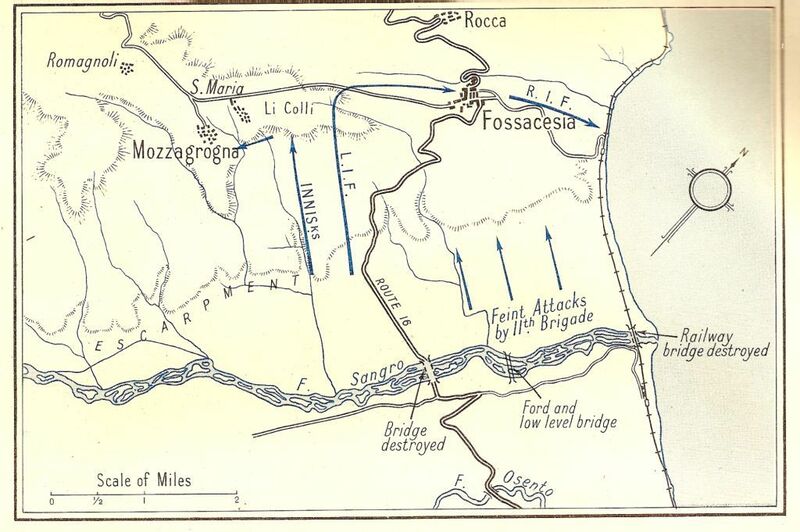 Their object was to reach the San Maria— Fossacesia road and to smash the German defences up to and in Fossacesia. This phase was to go in at 0830 hours next morning, and the plan had divided the German defences into seven blocks each eight hundred yards deep and four hundred yards long. All available artillery was to bombard the opening line for half an hour and then concentrate for ten minutes on each block in turn. As soon as the guns lifted from a block a squadron of tanks and a company of the London Irish were to enter it and clean up any enemy who had survived. The last three blocks in the plan were each two hundred yards deeper, so that the whole village of Fossacesia would be in the fire plan. Squadrons and companies worked together as follows: ‘A’ Squadron and ‘F’ Company; ‘B’ Squadron and ‘H’ Company; ‘C’ Squadron and ‘G’ Company; while ‘E’ Company was kept in reserve in the first stages and would be available to clear the northern part of the village if necessary. Except for the fact that the tanks, which had to go forward by road through Mozzagrogna to the start-line, were delayed by a German counter-attack on the 8th Indian Division, the preliminary moves were made without difficulty. Zero hour, however, was put back an hour to 0930 hours. The guns opened fire to the second and the attack went in in waves as arranged. It was completely successful, and by 1300 hours the ridge and Fossacesia had been cleared. The artillery had demoralised the enemy and this, coupled with the appearance of tanks and infantry from a completely unexpected direction, finished them off. Their defence fire was all prepared for a frontal assault and when put down was many hundreds of yards from our troops. Much material and many prisoners were captured at a cost of only two killed and eight wounded. It was a triumph for planning and organisation. “The Sangro was still a raging torrent but it was imperative to pass this obstacle as it was giving the Germans time to build up the Winter Line. A precarious bridgehead was won and a bailey bridge built close to the remains of the ruined bridge. On the other side was a vast river cliff a few hundred yards from the Sangro’s north bank. We crossed the Sangro and sheltered beneath the precipice as the company prepared for the next advance. A hospital was erected in tents with large red crosses everywhere. One morning, aircraft flew along the cliff face. At first, we thought they were ours but they dropped bombs and machine gunned the tents and vehicles. I jumped into the nearest slit trench but found it full. I was first in the next one, safe but uncomfortable as about four others lay on top of me. The next day, a shell clipped the cliff-top and exploded not many yards from me. I was shaving at the time and removed part of my moustache as a result. I took the rest off. Nobody noticed its passing.